Ana Humphrey's mom compared her to Harry Potter. "Something that’s really hard for normal people just doesn’t seem to be too hard for her"
Go girls in STEM! 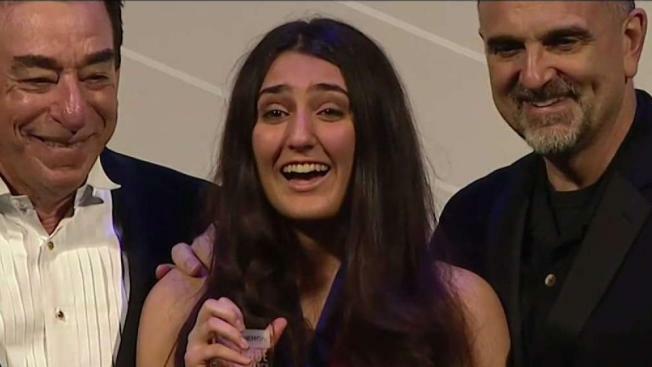 Alexandria high school senior Ana Humphrey won one of the top prizes in the nation for young scientists this week. News4's Julie Carey and Erika Gonzalez have the story. What if a high school girl in Virginia is the key to discovering hundreds of new planets? Ana Humphrey, a senior at T.C. Williams High School in Alexandria, won one of the nation's top honors for student scientists on Tuesday. Humphrey, 18, took home $250,000 and the top prize in the Regeneron Science Talent Search, which bills itself as the oldest and most prestigious science and math competition for high school seniors. Humphrey is the first Hispanic first-place winner in 20 years. Video footage shows her grinning as streamers rained down on her. The longtime student scientist and self-proclaimed "space nerd" developed a mathematical model to determine possible locations of planets outside our solar system, called exoplanets. "Hypotheses in the field say planetary formation creates dynamically packed systems, so Ana used her model to find 'unpacked' spaces where as many as 560 new planets might fit, and identified 96 locations as primary search targets," the Society for Science & the Public explained in a statement. "Her research could aid our understanding of the formation of planets and inform our search for life in outer space." Humphrey, who plans to become an astrophysicist, said her overall dream is simple. "My goal has always been to do good science," she told News4. Humphrey told the Alexandria Times last year that she fell in love with science as a seventh-grader. "I really started enjoying science fairs and the process of creating a project and learning really in depth about a particular topic," she said. "It was just the thing I wanted to do." Her mom, Luisa Tio, compared her to Harry Potter. "You know in the first Harry Potter movie when he’s taking that first class in flying?" she said. "That’s how I feel about Ana with math. Something that’s really hard for normal people just doesn’t seem to be too hard for her."